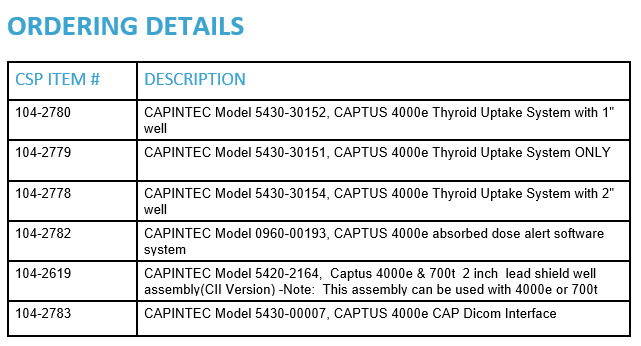 The Captus® 4000e is a comprehensive Nuclear Medicine Measurement System, with specific software modules for thyroid uptake, bioassay, wipe tests, automated quality assurance tests, lab tests, and isotope library. The system includes a fully functional 1024 channel MCA with auto and manual calibration. Timed activity mode features a programmable repetitive timed measurement program. Improved menu driven workflow and large 20 inch color touch screen streamlines user interface. The fully integrated DICOM interface communicates directly with hospital information systems, and can transfer patient, wipe test, and QC data. New and improved stand provides ergonomically adjustable monitor and easy to position articulating collimator arm. Four sided comfortable handle grips and swivel wheels ensure easy mobility. PC can be attached to either right or left side to optimize workspace. Reports include color graphics and isotope spectrum. Thyroid report includes time vs. uptake value graph. Out of range results are flagged. Reports can be printed or saved as .pdf files. The Captus 4000e includes both Cs 137R and the Eu 152 rod sources. Diagnostics and Tests: Fully automated Quality Assurance Section includes energy calibration, zero adjust, gain adjust, detector efficiency, detector resolution, chi-square, constancy, and MDA; Manual calibration available in MCA module.